With our eyes fixed on the beaches and coves of Ibiza, the bases of tourism on the island have been established. Its inhabitants are aware of this potential, and the protection of the environment together with the quality of services have led to splendid places with charm that have left their mark on visitors. Find out how to get to Ibiza’s beaches, what services you will have and if you are going to cover your needs. The beaches with more services are purely tourist and in the middle of the season they are overcrowded. The beaches that do not have a bus will be much quieter. Of course you will need a rental car in Ibiza to get to them. Each beach has its own special charm and you should not be surprised. The best beaches in Ibiza, what are they? Finding the best beaches in Ibiza will depend on what kind of place we are looking for. If we are talking about the best beaches in Ibiza to go with children, then we need a place with sand, no rocks and a bit urban. Es Figueral is a good example. If we look for the beaches of Ibiza where the celebrities go, Las Salinas awaits us. If we need an Ibiza beach to see the sunset, then the west coast awaits us with corners like Cala d’Hort or Cala Conta. The beaches of Ibiza city, or Ibiza, are urban beaches, with all the services you could wish for, and an important influx of public, usually in a family atmosphere. You can find all kinds of tourists, even Spanish. Talamanca will allow you to enjoy all the services and entertainment. Figueretas mixed tourists with residents a few meters from the center of the city, being a good Beach for children. Beach d’ Bossa brings fun and progress to the more purely tourist area. In Sant Josep, you will find the perfect place for any activity outdoors, with sandy beaches and bowling where enjoy the famous beaches and nudist beaches in crystal clear water. The beaches of San Jose in Ibiza are quite far away from the main parish of the municipality, so that your audience is very diverse. Shared Beach d’ Bossa with Ibiza, to make way for the reserve marina from the beaches of las Salinas and Es Cavallet. The best bays of Ibiza are also present with the paradise Es Codolar, of boulders in the middle of salt. Beach of Bol Nou, Cala Jondal, Xarcu is and Es Cubells leave the southern coast with the island of Es vedra as a point of reference. Climbing towards Sant Antoni, Cala D’hort, the coves of Carbo, Vadella, MOLI MOLI and Codolar to end the West coast beaches of Comte Island des Bosc of witness. Cala Bassa and Port des Torrent welcomed to the beaches of Ibiza in Sant Antoni. Entering this last town we find the beaches of San Antonio in Ibiza Es Pouet, Bay and Beach ‘ Arenal. It is Caló des Moro, Cala Gració and Gracioneta, small and isolated. Away from the Bay, Cala Salada, a magic corner surprises us. If you need a selection of beaches in Ibiza with charm, we suggest you to visit places such as Es Pas de S’illa or Cala Xarraca. If you prefer the quiet, the beaches of San Juan hide most unspoilt coves of Ibiza and deserted, corners of dream where the road does not come. The deepest island spirit coexists with the more mystical hippie stronghold of the beaches of Ibiza. The port de Sant Miquel, with the small Cove of Moltons and the impressive is Pas de S’Illa. The beaches of Benirras and S’ S’illot des Renclí, Xucla, Portinatx and Cala d’ Serra end up the beaches of Northern Ibiza. St. Vincent’s is bordered by the coast of Santa Eulària. The beaches in Santa Eulalia, Ibiza will give you the broader view of the Mediterranean, on a coast where it is difficult to not find a place to bathe. German tourism has made this area his second place of residence. Following the coast we have the area with more coves of Ibiza tranquil: S’aigua Blanca, Es Figueral, Canal d’ Marti, the coves of Boix, Mastella, LLenya, Nova and Es canar, most famous for its flea market than by its waters. Playa de Can Martina, S’ S’argamassa, Cala Pada, and Niu Blau will enable us to reach the city centre. The beach of Santa Eulària, continued by the mouth of the only River of the Balearic Islands gives way to a rocky coastline that ends with the appearance of Cala Llonga. Bordering the new Ibiza is S’Estanyol. If it rains, don’t worry. Only Ibiza we have prepared a Guide of Ibiza so that you visit the most interesting cultural places. The city of Ibiza or Eivissa houses three large beaches with some peculiarities. Located next to the natural paradise of Ses Paises, enjoy a beach full of services in a very natural environment. Ideal for walks and sports Beach, enjoys a wide sandy area. Develop good communication with the city in one of the favorite of the general public. If you are looking for a Beach in Ibiza near the port, this is a good option. The urban beach of Eivissa. In the Bay next to the port, we found three natural beaches along a promenade. Very set, both by day and by night, is a perfect place if you are looking inside of the city. At dusk, a small flea market surrounds the most central part of the ride. We are one of the most picturesque beaches in the town of San Antonio near the port, opposite the Passeig de Ses Fonts. The presence of large nightclubs gives a special animation in the evening of this town. The musical bars occupy much of the beach. San Antonio Bay is very prolific on beaches. It is located next to the beach of S’Arenal and can access it by road, taking a small detour, or via the coast. It is a popular tourist place with enough accommodation in the surrounding area. The more English Beach on the island. This Cove is located to the North of the port. Numerous musical venues give a special atmosphere to small arenal. The sunsets are well known as Chill Out music that resonates in the bars with more popularity. Café del Mar can be a good example. Probably the best of the coves of Ibiza. We don’t say it. Magazines have named it the second best beach in Europe. And that reason is missing them. In an natural environment, a very neat Beach opens road sheltered from the wind. Probably the best Beach in Ibiza to snorkel. The younger sister of Cala Gracio. The Bay which includes both is separated by a land incoming arenal splitting in two. So flirtatious one as another. If you stay in the surroundings it is a perfect choice. The quietness and the good atmosphere add votes on your visit to Ibiza. Speaking of Santa Eulalia is traverse steep landscapes while closer to the North. That rise, we are a sandy nestled between a very steep coast. The descent to the beach is quite pronounced , but that doesn’t mean the beautiful landscape that we discover. Also known as channel d’ Marti, this succession of arenales and low profile coast offers a unique set. The presence of an ancient Roman sitewe can add to his record. Boat ramps that occupy its coast offer spaces of sand where to sunbathe comfortably. This beach has two aspects. The best known leads to the famous mud baths which are located to the North. Here the beach is a strange mixture between nudists and young people. To the South the environment changes being much more familiar. The natural framework in which is is fantastic. Santa Eulalia Ibiza nearest Cove found in this place. After the great Bay of Talamanca coast hardens to a stretch deep and hidden. Before us a Beach flanked by two long jetties. A bar will be our contact with civilization. A place to explore. Located in the Centre of the town, with a spectacular seafront, this Beach boasts of one of the best equipped. Located next to the Marina of renown, an vast sand area allows to enjoy children and adults in a relaxed atmosphere with many recreational activities. Most famous for its market which by its beach, this small town has been made with a hole in the tourist scene. The presence of a jetty facilitates the arrival of recreational boats and marine excursions. The beach has enough services in a relaxed atmosphere. If you like to enjoy the swell, in the days of wind this Cove is simply spectacular. With an beautiful arenal, the wind tends to blow with intensity. The water becomes crystal clear in the calmer days. Next to the main beach, a small Cove rocky but very quiet even in the summer, will give us shelter. This Cove is an over one long succession of coves along this coastal stretch. This time we talk about a deeper stretch of sand with water activities varied. The skysurf is undisputed protagonist. The surroundings are not only highly recommended for lovers of hiking. Located to the West of Ca Na Martina and only separated from it by a few meters. A Jetty gives us the possibility to move from the town of Santa Eulalia until these calm waters. With everything you need for a day of beach, Cala Pada continues to amaze both inside and in the vicinity. The only River of the Balearic Islands was not going to be less. The mouth is located on the perimeter of the village, next to the beach of Santa Eulalia, forming a wide coastal arm barely separated by some rocks. The natural arenal is preceded by a beautiful stroll alongside the boats and a very abundant wildlife. This beach is not very well known. But it is a beauty. Flanked by a five-star hotel, access is a maze that leads to a beach of clear sands and crystal clear water. A very beautiful place with the Centre of Santa Eulalia as a backdrop. To the North of Es Canar, only separated by a few hundred meters, we find another adorable corner. Cala Nova is a different beach, a much more folksy environment. The presence of a campsite in the vicinity may be a good reason. Its vast sand area is a perfect place to spend a pleasant day. This beach is rather unusual. An arm of the sea invaded the land, creating a small lake where walking on the waters. Arenal becomes especially wide leaving us a much appreciated recreation area among the local population. An ideal place to spend the day with family. You have to see it. Much has changed this beach since our last visit. The reform of the hotel of the same name has been accompanied by a general cleaning and the creation of a good Pier. Now Beach glitters like never before as well as its surroundings. The atmosphere is pretty quiet.. The West coast of the island is a very different place to everything we talked about previously. Cala Carbó is a good example. The vegetation becomes pine forest and scrubland low. Tranquility prevails thanks to the little opening to sea Cove, offering. Waters calm and good atmosphere. Another of our favorite coves. Cala Vadella is situated in an unexpected setting. It is hard to describe the sensation produced by turning the steering wheel and find similar visual spectacle. It may that we find difficult to park but the place is worth since then. This Cove has to be part of your agenda if you like quiet places. The first arriving intends to dive in and let the time pass. The best remedy for stress if it is what you need. Luckily, it is a great unknown to the general public. Sand, crystal clear water and great peace. A Cove with access very complicated, especially if you have a long car. Parking will not be easy. There is only sand, all are rounded. By extension, it is not especially striking. If you’re asking has this beach as a tranquility that few others know. If you’ve seen an ad of a cala in Ibiza with spectacular houses facing the sea, chances are that you’ve already seen Es Cubells. The accessibility by car is uncomfortable. By boat it is not the same, and many of the clients who come to their exclusive beach bars choose this means of transport. Several small coves that tops a cliff of vertigo. This is not a Creek, it is a paradise , enveloped in a magical essence. 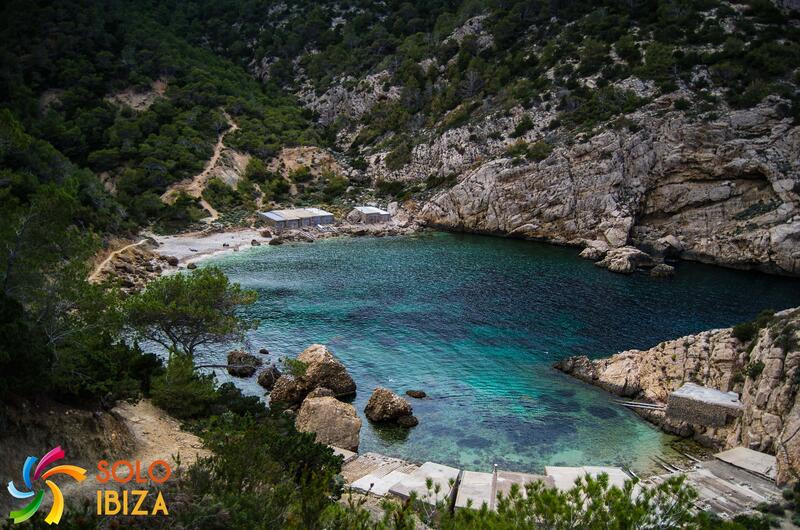 Located opposite the islets of Es Vedrà and Es Vedranell, considered one of the sources of energy on the planet, the mystery and legend that surround these waters make it a unique place in Ibiza. You can not miss the sunset. More nudist beach of the island. Located in the Natural Park of Ses Salines, World Heritage site, is the place chosen to practice Nudism. If we advance along the beach we discover several very popular environment bars. With Formentera as Fund, the reserve is of incomparable beauty. Another of the beaches that surround the Park of Ses Salines bears his name. Along with the salt Pier, is the island of Ibiza where are the famous. With a few exclusive bars, its sand is always full of statuesque bodies. The vicinity of the beach are very beautiful. The last beach that surrounds the Park is a little frequented codols (rounded) set. The truth is that we are at the entrance of the sea to the salt mines. Es Codolar converted view of flamingos and herons, coupled with the frequent presence of very chosen marine species in a different place. A beach made thoroughly. Next to the first human deposit discovered on the island, this beach access was more human than divine. Although the notice for detachment of the coast is constant, the attraction and beauty of the place make it a center of very usual meeting in the island. Of all the musical environments beaches, Cala Jondal is the most varied. Three bars with three different styles are a first line of beach. The sand make Act of presence on rare occasions on the boulders. The sundown, lights, camera and action. If you stay one day in Ibiza and we had to give you a beach to see before you go, Cala Tarida leave you with a terrifying desire to return. The main beach offers many attractions, but nothing comparable with the surroundings. The afternoon bustle is spectacular and the best beaches to watch the sunset. The Ibizan Beach par excellence. If you have not been here, you haven’t seen Ibiza. Three adjoining beaches offering a spectacular views of the island of Bosc. During the summer it is also one of the most sought after. The strong currents provide crystal clear water difficult to match. As difficult as the famous sunset. One of the most unusual beaches from San Antonio and, probably, of the most used. The presence of a campsite creates a homely atmosphere in its entirety, that is enough. A small lagoon welcomes us to a full service beach. A wharf will allow us to move by sea. The beach to the North of the municipality of San José is located in a small isolated Cove. Just before arriving at the car park you will find a chain of hotels that have become a highly sought after location. Its great arenal contrasts with the depth of a coastline formed by perfect platforms for sunbathing without smearing of sand. Our passage through the municipality of San Juan becomes a coming and going of small coves of difficult access. Cala xuclà responds perfectly to this profile. You won’t find many people here hardly available services, but it is really lovely. Just a few meters of sand and small rounded ahead. Probably, the quiet coves of Ibiza. Few are able to come and many less than down the road with the car. If you are of those who dare, these one cala very lonely. Immersed between mountains, the spectacular landscape leaves no room for doubt. One of the most impressive. The port of San Miguel is a large Bay which features small coves to its around. Some are accessible through a simple stroll. Others have a more complicated access. But if we decided to stay in port, we will have all the services that we can imagine. Important the visit to the caves of Can Marca. This is not a beach. They are two. A small arm of sea land joins the most expensive island in the world. The result is a magnificent landscape on both sides of the passage. From the front, the view of all the port of San Miguel. From behind, spectacular cliffs on a seafloor. The smallest of the small coves of San Miguel. For we must get walking from the beach of port through a small path. Arriving, it will look otherworldly. Protected by cliffs, the noise of the beach is hardly perceptible. Just any canoe bother us from time to time. Three creeks form the Bay of Portinatx, in the North of the island. A beautiful walk will allow us to travel most. The water dazzled by its turquoise blue. It is an area halfway between the tourist and the residential. As choice for sleep during the holidays, it’s perfect. This Cove was conquered by the big resorts for years. Aware of the potential of this beautiful space occupied its sea front. It is the only human presence in a panorama that includes much of the coast. The views of Es Figueral and Aguas Blancas have no waste. The beach where you will find the “finger of God”, nickname that referred to the small islet that emerges a few hundred meters offshore. Apart from the charm of the landscape, is known as the Festival of drums. At sunset, the beach rumbles to the sound of hard-to-describe songs. One of the most secluded Island beaches. The way she is full of surprises. A viewpoint on the road will show us the beauty of a rocky coast. Arriving at the beach, a set of huge stones comes the sea. The sand becomes very thick. It comes from a great batter who will protect us from the wind. Here we have found a very small stretch of sand between outgoing Rocky. Being flat rocks they are perfect to relax without the discomfort of sand. It is preferable to eat something in the quiet bar found in a superior platform than for a swim in its waters. Would you like to discover one of the most secluded and beautiful island coves? Because we’re going to ask that you share this website on any of your social networks and access to a unique place.